BikeCommuters.com > Commuter Bikes > The Ultimate Commuter Bike? Very nice. Would there be a benefit to the Rolf wheels over a more traditional, say, 32 or 36 hole wheel? Fashion? The Brooks Swallow is a racing saddle. A good old B17 would be a more logical choice, but I understand the Swallow is also likely a fashion choice. A very nice bike. I would have made different choices, of course. 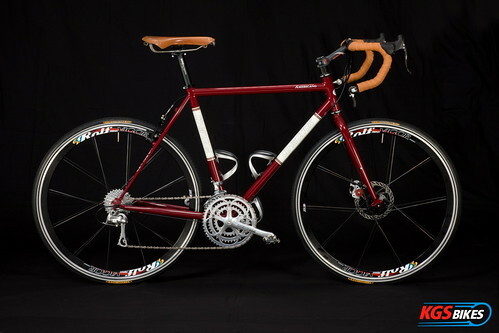 I would spec 36 hole wheels, Honjo fenders, a B17, and the bike should definitely have a rack. A stainless Tubus would be great. The seatpost and stem should be Nitto(again, shiny silver), as should the handlebar. I like the discs. And steel is real. Like the bicycle – but it’s pretty spendy for a commuter. The Swallow saddle definitely fits the price profile. In my experience, I’d say that the swallow isn’t about “racing” so much as it’s about dealing with a large drop between saddle height and handlebar height. The B17 seems better, and is advertised, for less aggressive drop heights. I agree with Mike though – with the relationship shown between the saddle/handlebar/hoods in the picture then a B17 would do really well. Definitely needs a cool classical looking rack. I was questioning the saddle choice myself…perhaps it was chosen due to its expense, not its utility or comfort? Fashion over function can be a dangerous thing in the worlds of commuting and touring…and expense doesn’t necessarily equal perfection. So the answer to the question you pose in the title of this post is no. Not even close. I would not commute on that bike. I’d love to own one, but I think it would get trashed if I rode it to the office everyday. If KGS was really wanting to choose components with high price being most important, then why not build wheels with Phil Wood hubs? Phil rear hub, Schmidt SON generator hub up front, twin Lumotec lights would fit nicely with the “cost is not object” philosophy. If push came to shove, I’d say my personal “ultimate commuter bike” would be a Waterford Adventure Cycle. My previous commute was 1.5 miles, something like this would have been wasted. My current commute is ~ 10 miles and something like this wouldn’t cut it due to the lack of racks and lights. It’s pretty, but not really a commuter. Definitely not a commuter bike any more than my track bike is. Beyond that, a real high-end commuter would have a rohloff hub, a chaincase, and ideally, a porteur rack. A commuter should be like a car, get on and go, no worrying about whether you can carry a load or deal with rain, or if it’s dark out. Why are people so afraid of derailleurs? All my bikes have them, they last a long time (I ride daily in the rainy rainy grimy PNW), easy to service, make it much easier to remove the rear wheel to repair an innertube, and easy to upgrade/replace at will. Nice weekend bike, but I agree, not a “commuter bike” unless your commute is a road ride into an office with no requirements to carry clothes, laptop, etc, on the bike. 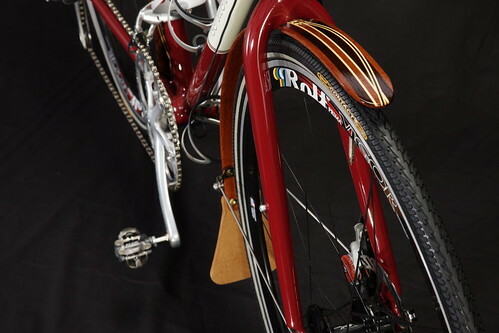 Saddle is for racing, fenders are pretty, but don’t look as functional as some SKS or planet bike fenders. I think what’s important is to acknowledge that what may work for a S.California commuter (no real need for fenders and stuff) may not work for a commuter in Portland. What I do enjoy seeing and reading about are the ideas on what makes an ultimate commuter for that particular person. Though the bike mentioned above is super sweet, I wouldn’t commute with it either just because I’d hate to be bike jacked or find it missing once I got to the bike racks. Yeah, it’s a loaded article title…but it worked to get people talking! 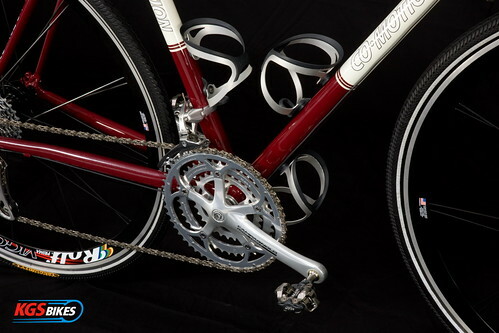 I chose to use the word “ultimate” because that’s how Kevin Saunders of KGS describes the bike. The question mark is all mine, though! This bike is meant for quite a long commute-it has 3 water cages? In my experience, my road bike always needs more frequent maintenance than my mountain bike. I think commuter bikes should be designed like mountain bikes (frame and tires) for reliability. If you have a long distance to travel- the road style is probably more appropriate. I’d be afraid to park it anywhere. Looks nice, but seat choice and fenders seem more for bling than function. In an “ultimate commuter” I would expect function to trump form. Not so much the case here. Thanks to you all for the awesome comments! I just remarked on another post that I learn so much from these experiences. The idea of this bike was to build up a frame that fit me for a commute I could do. Tubus racks are planned and I promise to come up with a wheelset that will do the job. I usually try to get one example of the best of a genre and I have much food for thought thanks to you. Please feel welcome on my blog, website or flickr site. Ultimate commuter? Where’s the chain guard! Chainguards or chaincases don’t fit on a triple front/ 10 speed rear system. I think that’s one of the reasons folks would like to see an IGH (Rohloff) on a bike like this. I wouldn’t kick it out of bed for eating crackers. I was interested in the wheels though. I have been considering a jump to a tandem wheelset. I bust spokes a little more frequently than others. I wonder if a tandem set would benefit me? Have to agree with other postings about this not being a good commuter bike but more of a fancy coffee bike. Great comment, Dean Peddle. I liken this to a work in progress so who knows what this bike will morph into. The process will be a blast, however, and we all may get some more ideas. This is the point. The bike may be more ride to Starbucks now, but since my business is on the highest of high end, I am always looking to improve. I like the narrower saddles but think the Team Pro is one of the best ever. I had it on an early racing bike, on touring bikes and tandems. One last thing I have discovered over the years. If a bike is fitted properly one doesn’t need a crazy split saddle for the most part. This frame has a 145 mm spacing. I will do some homework on the IGS Rohloff and see if I can make it work. I am not worried about chainline because a Phil bb can get us right there. I don’t know how difficult it would be to fabricate a longer axle setup if this is a strictly 130 mm hub. I may have mentioned I have the sister of this bike in British Racing Green with cream panels. It has the ability to move in a different direction than this bike. Kevin, there must be a version of the Rohloff with a long enough axle for tandem rear spacing…I’ve looked on their website and it is somewhat confusing over there, but I’m convinced there’s a hub for this application! Kevin…you are absolutely right….nobody needs a split saddle…that has to be the silliest bike gimick I have ever seen. I’m so happy that more and more bikes are being sold with leather saddles again!! Well the bike has a rockin set of Tubus racks as well as Ortlieb panniers. I put the long distance touring set on there, front and rear panniers and a handlebar bag, so the commuter moniker may go away but it is still a cool bike! I have another Americano that will have a more utilitarian fender set, rear racks only and Ortlieb Classic panniers in the back and will have pics soon. Thanks so much for your comments. Oh. I like the narrow saddles better and the choice of the Swallow was my particular comfort and the fact that I think they are cool. B17’s are a little wide and I like Team Pros very much. I have been riding bicycles for transportation my whole life. I have ridden almost every type of bicycle at some time in my life. I currently commute on a converted old-school early 80’s Norco Pinnacle mountain bike. I added fenders, a rack and bags, bell and lights. Works fine for me. My point is the ultimate commuter bicycle is one you will actually be happy riding. It is not the same for everyone. Some like mountain bikes because of rough roads or potholes and jumping curbs…others like racers or fixies…Some are happy with a cruiser, I even have a friend who rides a bmx to commute! Different strokes for different folks. The important thing is to get people riding, who cares what kind of bicycle, as long as they’re riding.